Of the 25 colleges in Goa offering regular degree programmes, 21 have got themselves evaluated by the National Assessment and Accreditation Council (NAAC), besides two professional colleges which offer degree courses in law and another institute offering a teachers training degree programme. Of these colleges, five have earned themselves an ‘A’ grade and two others have been accredited with B++ grades. The NAAC’s peer teams that visited Goa’s colleges seem to have found Goa’s colleges meeting a good degree of its expectations from institutes of higher education as no institute in the state has been allotted a grade below ‘B’. Grades A and B and those falling in the range in between these two grades, i.e. B+ and B++, are considered to be ‘very good’ to ‘good’ ratings as per NAAC evaluation system. Dhempe college of arts and science, Miramar; V M Salgaoncar college of law, Miramar; Smt Parvatibai Chowgule college of arts & science, Margao; Rosary college of commerce & arts, Navelim; and St Xavier’s college of arts, science & commerce, Mapusa, are the institutes accredited by NAAC with an A grade. Besides these, Carmel college of arts, science & commerce, Nuvem, and Fr Agnel college of arts & commerce, Pilar, have been allotted a B++ grade by NAAC. And nearly all of Goa’s colleges have been able to improve their grades over the years during the various NAAC evaluation cycles or atleast retain the grades allotted to them. In addition to the colleges accredited with A and B++ grades, B+ grades have been earned from NAAC by Government college of arts, science & commerce, Quepem, and Government college of arts, science & commerce, Khandola. 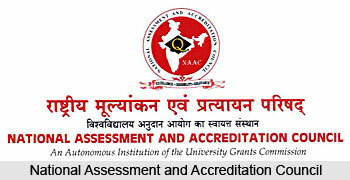 The rest of the colleges in Goa that have undergone the accreditation process have all been allotted a ‘B’ grade by NAAC. While a ‘C’ grade by NAAC denotes satisfactory performance by the college, a ‘D’ grade means unsatisfactory work by the institute. But none of the colleges in Goa have earned these two low grades.